Graphic designer, Brandi Prescott hopes to work her way to the top at the Seattle ad agency where she’s employed. She’s dedicated and distraction-free since she’s taking a hiatus from men to focus on her relationship with the Lord and get to know herself without the influence of another person. Software engineer Ian Parker is in a good place. He loves his job, his social life and the direction his life is going. At least that is the case until one fateful rainy morning when he meets a woman who changes everything. The only problem is, she won’t go out with him because she made a pledge to not date for six months. 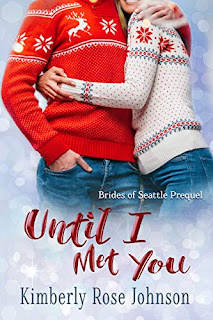 This is a prequel to the "Brides of Seattle" series and we get to meet Brandi and Ian as well as Ray and Katie who are in the first book in the series "The Reluctant Groom". I enjoyed reading the story and found it to be well written. I liked Brandi's desire to grow in her relationship with God and put Him first in her life. I look forward to reading more books in this series.